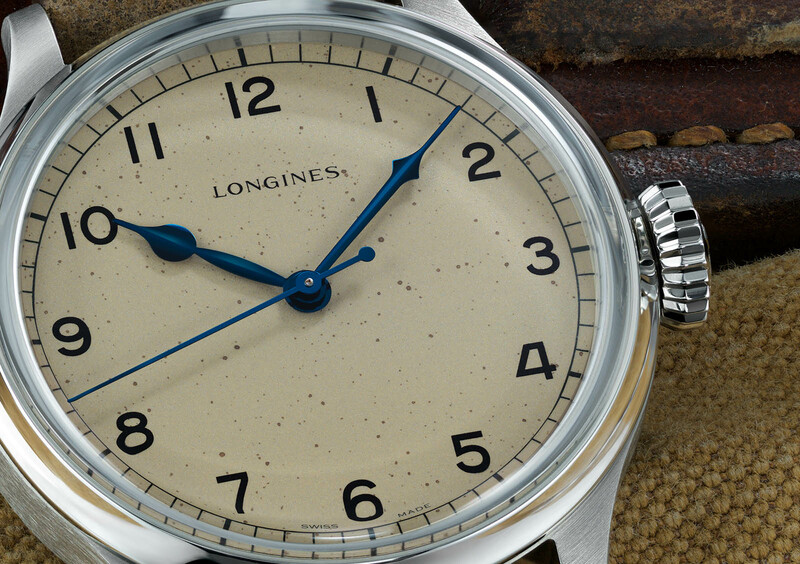 Longines’ Heritage collection relies on its extensive archive, skilful adherence to original design, and sensible pricing, to create a string of appealing historical remakes, including the recent Heritage Skin Diver. Shown at Baselworld 2018 but not officially launched, the latest addition is the Heritage Military Watch that takes its “faux patina” very seriously. 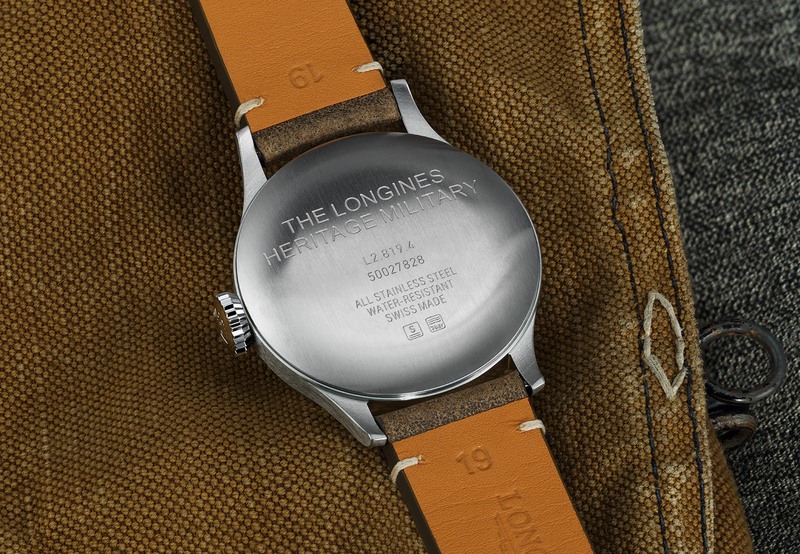 Based on the 1940s 6B/159 pilot’s watch supplied to the British Royal Air Force – other suppliers of the watch included Omega and LeCoultre – the Heritage Military retains the key features that distinguished the 6B/159, a white dial with a railroad minute track and blued steel hands, setting it apart from nearly all military pilot’s watches that have black dials (though some remaining 6B/159 watches were later refurbished with black dials in the 1950s by the British military). The modern day remake is made to look like it has actually seen service in the 1940s thanks to an off-white dial peppered with flecks of black paint, a convincing replica of the aged originals. It is nevertheless the result of a modern process, with the dial being spray with black paint by hand to create a random pattern, making each dial unique. 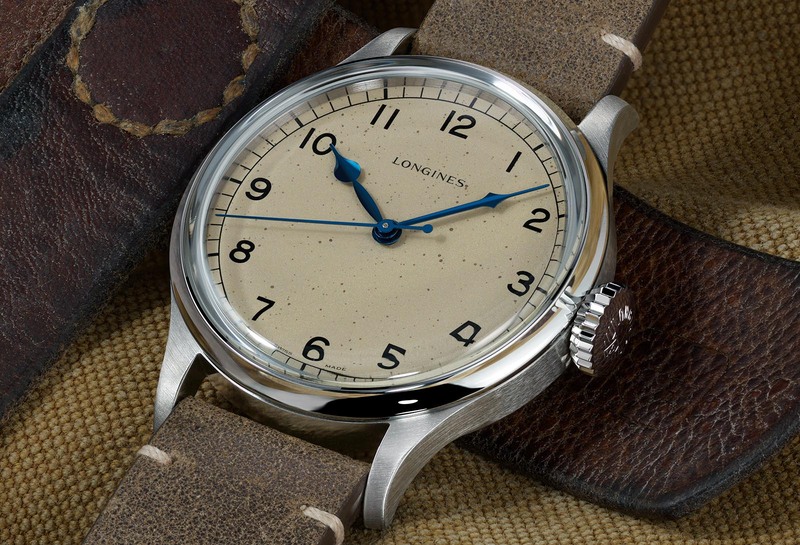 Staying true to the original, which was hand-wound, the Heritage Military Watch is the only self-winding watch in Longines’ catalogue that does not bear the “Automatic” label on the dial. And it also has a similar oversized, “flat onion” crown, as well as a domed, “box-type” sapphire crystal to mimic the the original’s PlexiGlas crystal. There are, of course, a few elements that bring the watch up to date, the first being its size. The stainless steel case has been bumped up to 38.5mm, compared to 32.5mm of the original, with a height of 11.7mm, a size that is nonetheless relatively compact by modern standards. 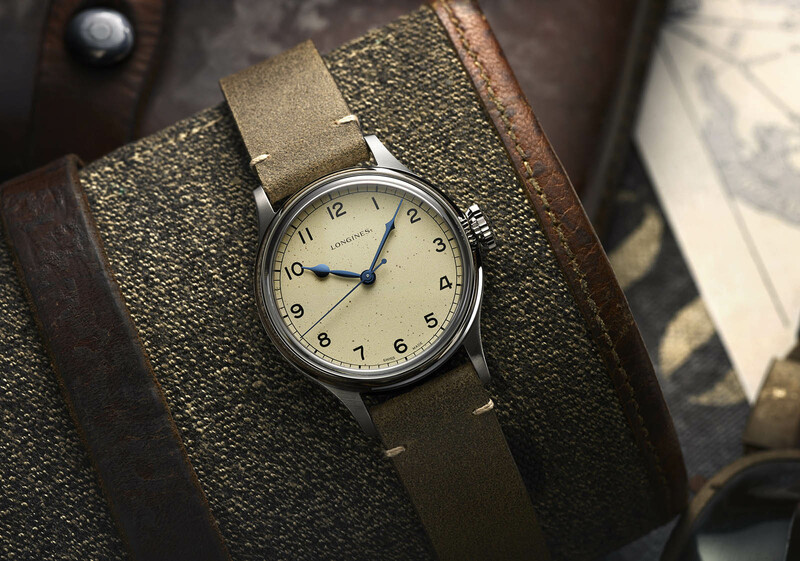 Notably, while screw-down backs are almost standard amongst Longines’ sports watches today, the Heritage Military has a snap-on back with a brushed finish, just like the original 6B/159 (which had military markings that are necessarily absent from the remake). Hidden behind the case back is the automatic cal. 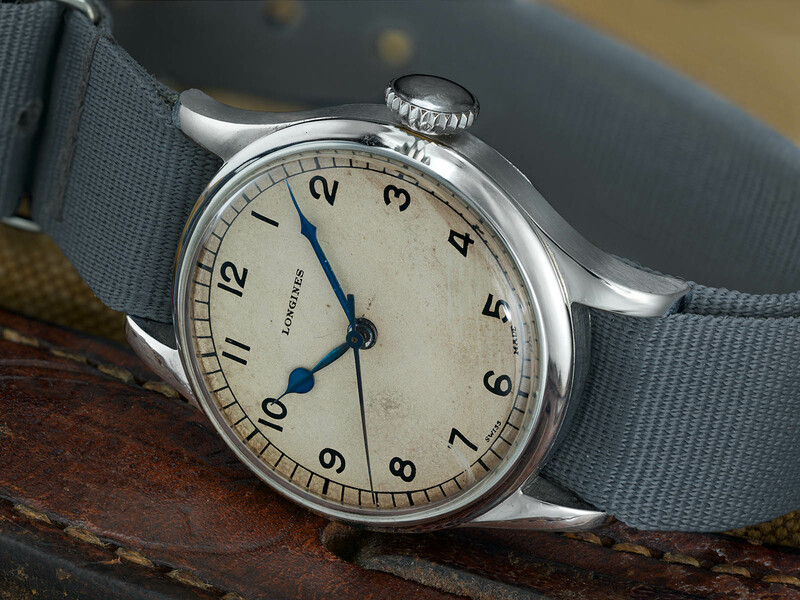 L888.2 – the same movement found in the Heritage Skin Diver and Railroad. It’s essentially an improved ETA 2892-A2 made exclusively for Longines, with the most significant upgrade being its 64-hour power reserve instead of the standard 42. 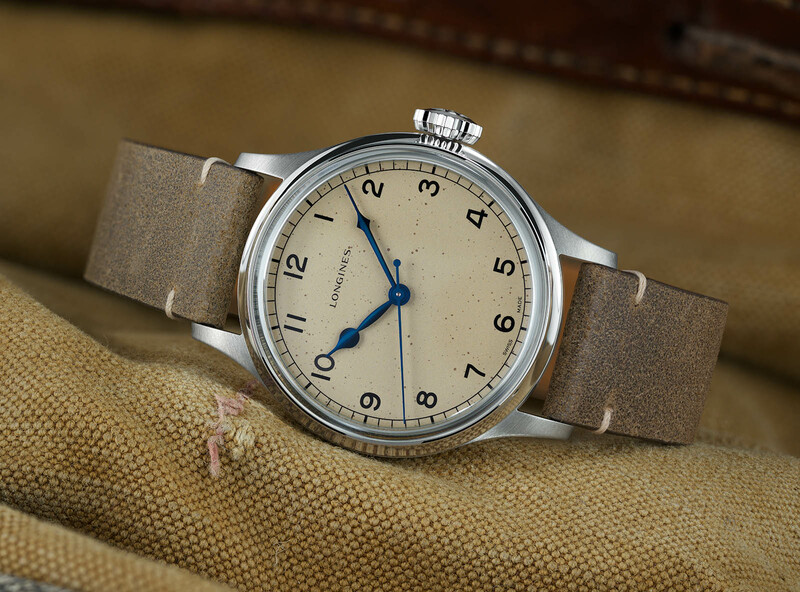 The Longines Military Watch (ref. L2.819.4.93.2) is priced at US$2150 or S$3180, and will be available starting November 2018.